How does one foster innovation? Find the prime combination of creative expertise and mature technologies to achieve maximum results in minimum time. 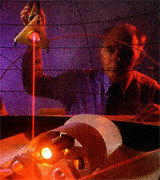 Stimulate creativity and productivity by challenging scientists and engineers with new concepts. Create a climate in which each individual can excel. Provide the resources to do the job right, but do so strategically and economically. Recognize excellence. To create, develop and license applied physics and engineering technologies that have high-leverage impact in science, medicine and commerce. To greatly accelerate development of important intellectual property and to expedite its transfer to industry. To empower applied science to achieve new levels of distinction for sponsoring institutions. RCIG's expert project teams know how to develop breakthrough products in partnership with influential industries and government agencies. Our entrepreneurs and technologists are motivated to excel because they gain long-term advantages by affiliating with powerful partners. Dr. John D.G. Rather, President of RCIG, provides access to exceptional intellectual and technological resources to engender vigorous progress. The resulting empowerment of basic and applied research activities can result in vital new products and enhanced levels of distinction for both the sponsor and RCIG's teams. RCIG fosters an approach that enables it to conceive and create high-impact, forward-looking solutions for the private and public sectors.